Well, I'm in the process of ripping apart eComic and rebuilding it from scratch. The two biggest aspects that will be changed (from the user's POV) are the inclusion of comic properties and library functions. Well, not so much library functions as card catalog functions. Additionally, I'm modifying the UI to allow multiple tabs of comics being open (again--I keep going back and forth on this), and structuring it around a UI layout which I'm highly familiar with: Visual Studio. As you can see from the image to the right there, it contains the tabbed interface, plus allows for the LIBRARY to reside in an tab all its own, as well as the PROPERTIES element to be always available. I'm also keeping the ribbon menu, as I really like Ribbon menus. I'm trying to decide if I want to continue using the circle style application menu (as it exists in the previous version), or go with the square one as shown in the image. I'm not going to lie, I made the icon with the thought that it would fit within the circle-style application menu. 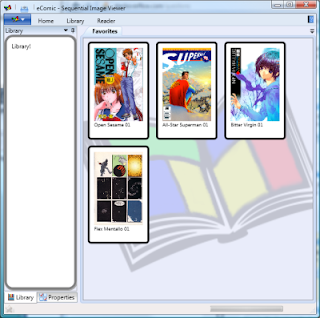 The first aspect of a LIBRARY system that I implemented is the FAVORITES screen. This will also be the start-up screen when a user comes into the application. Each favorite is click-able, and when clicked loads the associated comic into the reader. The FAVORITES screen will also be the basis for the lists screen (and search results screen) once I get all the library tools built. I also made the system much more MVVM friendly. In the previous version, MVVM was there, but there was still a lot of manual control of the displayed page. Basically, the Reader control was responsible for both loading the pages into the ComicBook class, and controlling which page was selected at any given moment. I've now made that all controlled via the ComicBook class via Databinding to the relevant list controls. Sure, I can manually modify that with a next/previous and Go To functions, but the primary navigation is now controlled entirely via binding processes. My next steps are to get the LIBRARY working, and to determine if I want this system to watch files, or if I want it to just control the files that are associated with it. There's pros/cons associated with both paradigms, and I'm not sure which is best. Sadly, I fear I may have to install iTunes and waltz through it, and figure out what it's doing with its media functionality. The Kindle software makes more sense (everything's in its folders) but it also has the benefit of being the front-end of a store. The primary way you get content into Kindle is by purchase via KindleStore, and that's just not the case for my software; as the primary way you'd get content for eComic is to either a) download it, or b) media shift the comics that you've purchased. I'm not sure that would work for me, as I have so many fields to consider: Series, Issue Title, Alternate Series Title (i.e. Story Arc Title), Volume, Book Number, Artist, Writer, Publisher and finally Publish Date. Oh well, I'm sure I'll figure out some sort of solution.